After years of unbeatably amazing songs, Linkin Park, the world’s one of the most loved bands has disappeared from the limelight for a while leaving the fans in a conundrum. It has been a decade and Chester Bennington’s ‘Numb’ is still echoing in our brains. Thanks for the relatable and sensible songs Chester, Linkin Park is no longer as it was before. It is just two days and it is really rough to believe that the legendary singer has committed suicide. Sources claim that Chester has been suffering from Depression for some long time that eventually led him to do suicide. Now, imagine the situation with the family members of Chester, they are now drowned in agony. Chester has six daughters with his wife Talinda Bennington. In the midst of this unfortunate event, Talinda’s official Twitter account got hacked and the tweets then posted were quite ridiculous and obviously much derogatory. 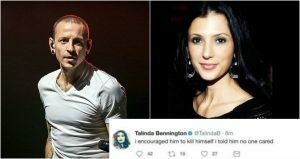 With the jokes on Chester’s death and blabbering lies about Talinda having an affair, everything that was posted replicates the marks of insanity we’re living in. 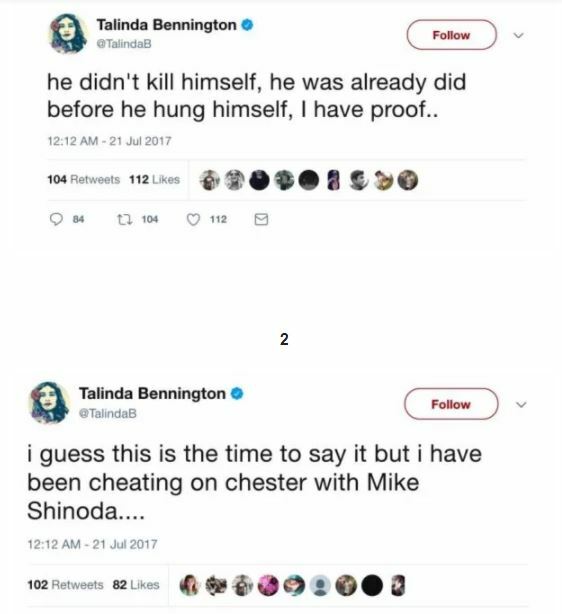 In the tweets, it was said that Talinda encouraged Chester to suicide by manipulating him to think that no one cares. Soon after she complained about it, Twitter acknowledged, and the tweets were taken down from her account. Earlier, there are many situations when celebrities’ Twitter accounts got hacked and we have seen the hackers posting some funny content and trying their best to troll the original users. But things that happened with Talinda’s account are quite saddening and distasteful. We wish the authorities will get rid of the hacker ASAP or there’s Karma for them, waiting to punish them.